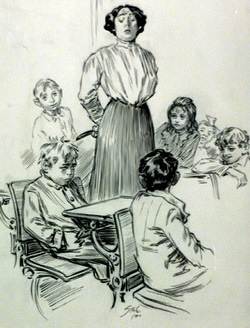 In order to gain and keep control in the school-room, the teacher must have certain characteristics, natural or acquired. One must have self-confidence without conceit, self-control without coldness or stiffness of manner, a sound and active intellect, with good judgment and a keen sense of justice, and an unselfish interest in the welfare of others. No one, of course, completely fills the bill, but the above is a good ideal to keep in mind. Women are more often deficient in confidence and self-control, and men are more likely to lack in unselfishness, and to have an unnecessary amount of conceit. With the smaller folk plenty of physical activity and short periods for other exercises are necessary. 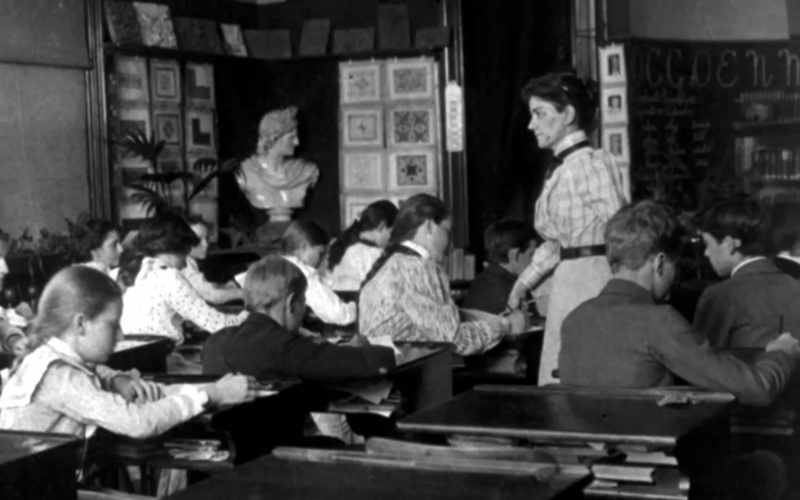 Then, if the teacher can present her work in a way to hold attention and interest, and is firm but kind in insisting on obedience, little difficulty will be experienced. With the older pupils the opening day is most important. Begin with the assurance of success firmly fixed in your own mind, or in as near that state of mind as possible. One who enters the room timidly and deprecatingly is bound to have trouble, and that soon. Even if you can not help “shaking in your shoes,” use all your powers of self-control to appear unconcerned and as familiar with first days as with your breakfast. Every eye is on you for the first few hours and days, to see of what stuff you are made, and just as soon as the shyness of novelty has worn off, if not sooner, some irresponsible person will “Do it just to see what teacher will do.” If you hesitate then you are lost, – for the time at least. Do something yourself and do it quickly, so quickly as to take away the breath of the insurgent. You need not necessarily be harsh, a little quick, sharp sarcasm that will make the school laugh with you at the offender, is one of the most potent weapons you can use. If you are not sharp enough or quick enough and the pupils laugh at you instead of with you, you lose. However successful a proceeding of this sort may be, do not always do the same thing; an unexpected punishment, especially if it have the elements of poetic justice, is often more effective than a commonplace penalty that is much more severe. 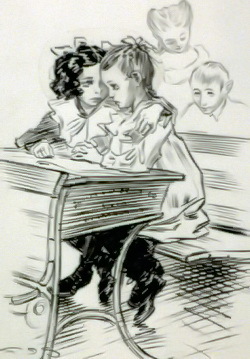 If, as not infrequently happens, a boy has a bad cough that sounds unnatural and proves very disturbing, it is much more effective to send him to the principal or to his parent, with a note stating that he has such a bad cough that he can not be allowed in the class-room until it is better, than to punish him directly. Under such circumstances I have seen some remarkably quick cures of distressing pulmonary affections. I find boys more often need sharp, short checks than girls, as girls are naturally more tractable than boys. 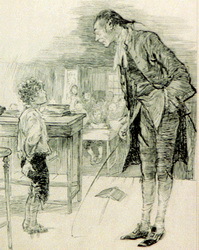 But a boy rarely bears ill-will toward a teacher for giving him his just deserts, while a girl’s sense of justice is much less keen, and she may bear a long grudge for a punishment that was eminently fair and just. A great deal of care can be used to advantage in punishing girls, as they are very sensitive to ridicule, and a reprimand that will only make a boy grin sheepishly, will often move a girl to tears and a long period of sulks. Make just as few rules as possible, and do not lay down exact penalties for offenses; if you do, you will find yourself in very disagreeable situations that might easily have been avoided. State that the penalty is likely to be enforced, if you like, but always reserve the right to use your own discretion. Avoid as you would the Evil One himself any appearance of personal vengeance, or even of purely retributive punishment. Strive in every way to show that your punishments are to prevent future offenses, not to “pay up” for past misdeeds. Perhaps the two most vital requirements for success in school discipline are self-control and justness. These qualities will win respect and admiration for the strictest disciplinarian, while the good-natured “easy” teacher has neither. If you can not control yourself, you can not satisfactorily control others. 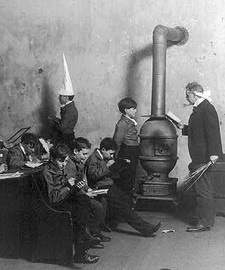 I have often seen teachers so easily aroused to a passion, which vented itself chiefly in angry abuse and threats, that their pupils would purposely stir them for the purpose of enjoying the degrading diversion furnished. By sheer force of mind and tongue, or as a last resort, by physical force, one may keep order, but keeping order is no more controlling one’s pupils than sitting on the safety valve is putting out the fire under the boilers. You do not control until you control mind as well as body. Here lies the danger of corporal punishment. It is often used to compel order and deludes the teacher into a belief that he has control when he has only the outward obedience due to fear. Although quickness is almost imperative at times, it does not necessitate even the appearance of anger. Let the offense be treated as entirely impersonal and a detriment to the welfare of all. If matters are to be discussed as personal, let them be discussed in a friendly way with the pupil alone. We are all fallible and prone to make mistakes. When you find yourself mistaken, acknowledge it at once, fully and frankly. If your mistake has been of a personal nature, apologize and make as full reparation as possible. If this is done in a frank, manly way, you will always gain and never lose, unless you are a hopeless blunderer and unfit for the school-room. You may have almost perfect outward control and the entire respect of your pupils with little or no affection toward you. Affection you can not have in any considerable degree unless you, yourself, have an affection for the untrained and chaotic, often rebellious, but essentially open and plastic natures, that look out at you from the windows of those unlined faces that greet you every morning. Love is the greatest thing in the world in the school-room or out, and he who gives and gains has the key to the control of young minds and hearts, and he has it not for the hour or for the day, but for all time – and perhaps beyond.